1) Find a copy of THE FUTURE IS WRITTEN by @jonassaul and take a picture of it in a @barnesandnoble store. Take a selfie with it. Take a unique photo. Snap a pic of it on the shelf. 2) Post the picture on FACEBOOK as a "Public" post to allow sharing and tag @jonassaul. 3) Jonas will add you to the list of people who are in the contest and live footage of the winners will be broadcast on Facebook after the contest closes on October 10. Have fun book hunting and good luck! Go write your own future! First Place: $50 Barnes & Noble Gift Card and a signed copy of the new release, THE FUTURE IS WRITTEN, as well as you can become a character in a future novel. Second Place: $25 Barnes & Noble Gift Card and a signed copy of the new release, THE FUTURE IS WRITTEN, as well as you can become a character in a future novel. 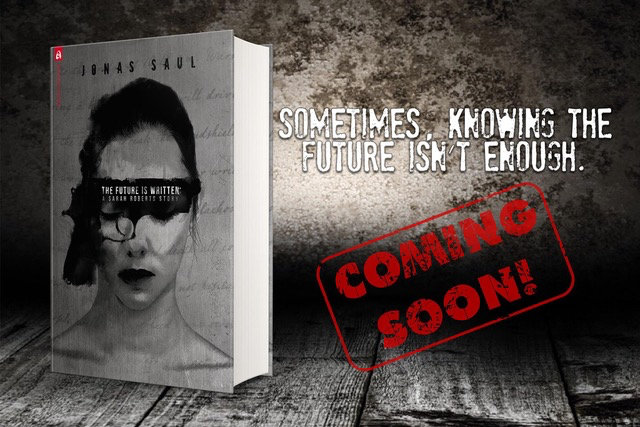 Third Place: A signed copy of the new release, THE FUTURE IS WRITTEN, as well as you can become a character in a future novel. Fourth to Tenth Place: All of these winners can become characters in a future novel. For all ten winners: they will receive the novel they become characters in for free in ebook format on the day of its release. When Sarah Roberts blacks out, she wakes to find prophetic notes mysteriously written by her own hand. After receiving a message that someone is about to be kidnapped with instructions on how to stop it, Sarah’s convinced it won’t be hard to do. She is wrong. The kidnappers take Sarah instead. She’s thwarted them in the past, and they want to know how she keeps showing up where she has no business being. Sarah needs help from the police, but they’re hunting her for a different reason. They found her notebook riddled with prophetic messages, linking her to crimes and unsolved cases. Is she a vigilante keeping score? Or on a citywide crime spree? Several years ago, someone murdered Sarah’s sister, Vivian. Now, communicating with Sarah from the other side, they’ll hunt the man who did it and the people who would do it again―to Sarah.